In January, MarineQuest launched Turtle Trash Collectors, a new outreach program funded by the NOAA Marine Debris Program. The 2TC program is designed to use simulation-based learning to educate youth about the impacts of marine debris and encourage behavior changes that will reduce the generation of marine debris in the future. 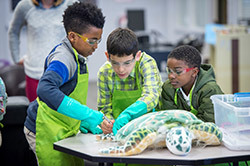 MarineQuest staff created life-like sea turtle models, complete with internal organs. Students use these models to conduct simulated turtle necropsies and determine what may have caused their demise. MarineQuest’s sea turtles made their debut at Pine Valley Elementary School on January 7. So far the program has served students at Rachel Freeman School of Engineering, Union Elementary, Surf City Elementary, North Topsail Elementary, Blue Creek Elementary, College Park Elementary and D.C. Virgo Preparatory Academy in January. 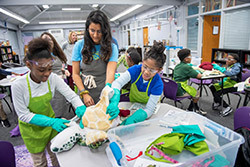 During a program at Virgo on January 28, 4th and 5th graders participated in a turtle necropsy and found harmful straws, balloons, bottle caps and plastic bags in their turtle digestive tract. Laura Sirak-Schaeffer coordinates MarineQuest’s Turtle Trash Collectors program, which serves coastal counties (including New Hanover, Pender, Onslow, Carteret, and Brunswick) as well as several inland counties in the Cape Fear watershed (Columbus, Bladen, Sampson, and Duplin). Elementary schools in these counties who are interested in scheduling a program should contact project staff at MarineQuest@uncw.edu and include “Turtle Trash Collectors” in the subject line. To learn more about MarineQuest’s 2TC school visits, follow them on Facebook.